Last night while doing an after dinner stroll online through the aisles of eBay, I found this gem. 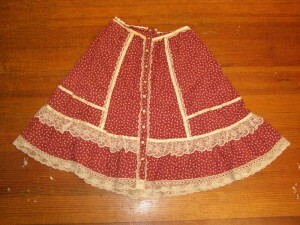 Man, does this skirt take me back! I think my lust for this fashion-forward skirt of the late seventies/early eighties came partly from watching one too many Little House on the Prairie episode and my rampant readership/abuse of Young Miss Magazine which was full of clear faced dew models sashaying from cover to cover in dainty flower printed prairie skirt awesomeness. To dream a little dream when one is young. *Total side bar, but when I went to IMDB.com to find the info on the movie, I came across the Variety story, “Hamilton Stakes Out Batrimony”. Oh, Variety, I love your bad puns! Author Miss DottiePosted on September 1, 2009 Categories Oh my!! !